Conor O’Shea’s side had Wales on the run for an hour. George North runs in to score Wales' third try. LEIGH HALFPENNY KICKED 18 points while Jonathan Davies, Liam Williams and George North touched down in a far improved second half as Wales got their Six Nations campaign underway with a 33-7 win over Italy in Rome. Wales travelled to the Stadio Olimpico expected to coast against an Azzurri side they had beaten 22 times in 24 encounters. But Italy’s shock 20-18 upset of South Africa in the November tests was a reminder of their marked improvement under Irish coach Conor O’Shea and for nearly an hour Wales were on the back foot. Italy took a 7-3 half-time lead into the dressing room thanks to a battling defensive display that was shorn of many of the errors routinely produced under former coach Jacques Brunel. But a superb second-half display saw Warren Gatland’s men score 30 unanswered points as Italy were handicapped by Andrea Lovotti being sent to the sin bin on the hour. At the start Wales didn’t do themselves any favours. Halfpenny missed a second-minute penalty from distance and the visitors suffered another setback when captain Alun Wyn Jones was temporarily forced off for treatment. When Williams collected Dan Biggar’s cross-field ball wide on the left on the quarter-hour, he was brought to heel by Carlo Canna. Wales had Italy’s defence pushed to the max yards from the tryline as they went through 10 phases, a solid defensive display from Italy that was matched by a huge performance form captain Sergio Parisse. Parisse, claiming his 122nd cap, was inspirational in the opening half, producing a great offload to Abraham Steyn just outside the tryline that allowed Edoardo Gori to drive under the posts for their opening try on the half hour. Carlo Canna hit the conversion for a 7-0 lead and the hosts finished the half buoyed after setting up camp deep in Welsh territory for the final two minutes of the half. Sam Davies replaced Biggar at fly-half for the start of the second half but it resumed in ominous fashion, lock Jake Ball requiring treatment for a head wound following a clash in the opening minutes. But three penalties in quick succession from Halfpenny, including one awarded after a dangerous tip tackle by Steyn on Ross Moriarty, soon had Wales back in contention. By the 56th minute, Wales were 12-7 to the good and were soon in command as Italy lost all hope following Lovotti’s sanction. 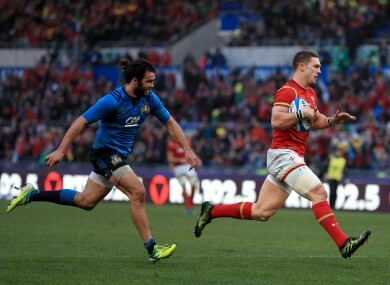 Wales had the Italians stretched along the try line and when Webb spotted a a gap on the blindside the ball was spun right, Scott Williams collecting possession and taking out two players with a feint to set up Jonathan Davies for his 13th try in 60 matches. Halfpenny hit the conversion to give Wales a 19-7 lead on 62 minutes but the visitors were far from finished. Minutes later Webb, Williams and Davies combined again as the ball was spun out to the left for Williams to touch down with ease. Halfpenny’s conversion took the score to 26-7 on 69 minutes. Italy pushed hard in a final, desperate bid to fight their way back into the match but Lovotti’s absence had done the damage. The hosts were already exposed and strung out along the Welsh 22 when North collected possession, burst down the right flank and cut inside full-back Luke McLean to touch down in the 78th minute. Halfpenny added the extras for a 33-7 lead but a final push for a fourth try, and a bonus point, was thwarted when Liam Williams lost possession next to the try line. Email “Wales late show stuns valiant Italy in Rome ”. Feedback on “Wales late show stuns valiant Italy in Rome ”.